Microsoft Classroom is a virtual space where you can manage all of your classes. It allows you to create and grade assignments, design different class sections, provide personalized individual feedback and collaborate with other teachers in Professional Learning Communities. Microsoft Classroom comes included in Office 365 for Education which you can access from the App Launcher in Office 365 navigation bar. 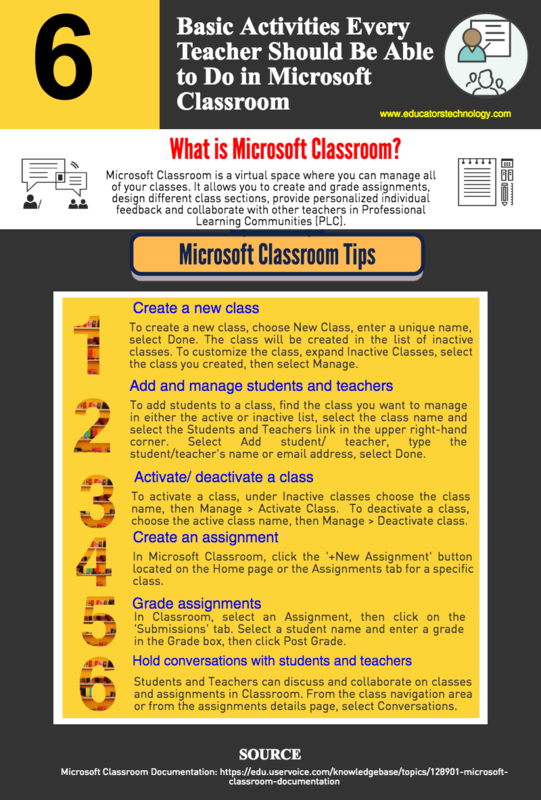 Below is a visual we created based on instructions retrieved from Microsoft Classroom Documentation page. It features what we think are the 6 basic things every teacher using Microsoft Classroom should be able to do . To learn more about Microsoft Classroom, check out these resources. 'Creating a new class in Classroom is automatic for schools and districts that use School Data Sync, which is included in Office 365. Classes, teachers, and students are automatically created and enrolled using the class roster information in the school’s student information system. For schools that do not use School Data Sync, Microsoft Classroom gives teachers the option to create and manage classes manually. ‘To add students to a class, find the class you want to manage in either the active or inactive list, select the class name and select the Students and Teachers link in the upper right-hand corner. Select Add student, type the student's name or email address, select Done. ‘To activate a class, under Inactive classes choose the class name, then Manage > Activate Class. Activating the class makes assignments visible for all students. In Classroom, select an Assignment, then click on the 'Submissions' tab. Select a student name and enter a grade in the Grade box, then click Post Grade.